Add a beautiful map to your Wpf application fast and easy. 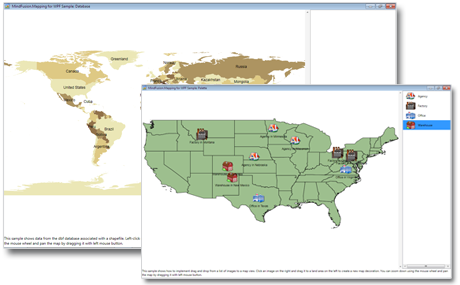 MindFusion.Mapping component provides you with a rich set of features for displaying and customizing any type of map. You have a variety of options to make the map look exactly as you wish it - you can change the color scheme, add decoration images and bubbles at exact locations, assign labels to map elements. The font of the labels is customizable and you can load the labels automatically from the ESRI Shapefile. The decoration bubble has customizable font, fill, border and label. MindFusion.Mapping lets users zoom the map with the mouse wheel to get more detailed view of a given location. If the map doesn't fit into the available space they can scroll it. The control provides you with a set of events which you can use to implement different scroll or zoom logic. You can add several map and decoration layers to each map you create. This lets you display richer, more informative maps - you can show the map of a country, add a layer with special geographical data like roads and add another layer with decoration objects that mark places of importance. 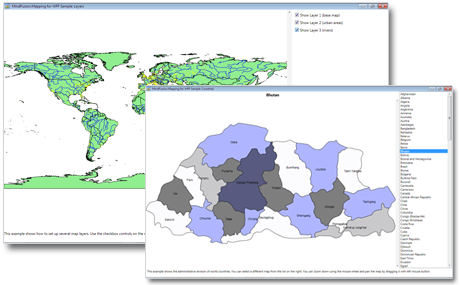 MindFusion.Mapping for Wpf can load any file with the ESRI Shapefile format and its associated database. This gives you the freedom to define a large range of attributes for the map elements. The component includes a rich choice of ESRI files with various geographical data, which you can use in your application.